Coach Roy Benson helped us design this heart rate monitor for runners based on a simple idea. When you're running, you should think about running, not your watch. So the Triax C8 requires less button pushing and has a more readable display.Continuous heart rate display. 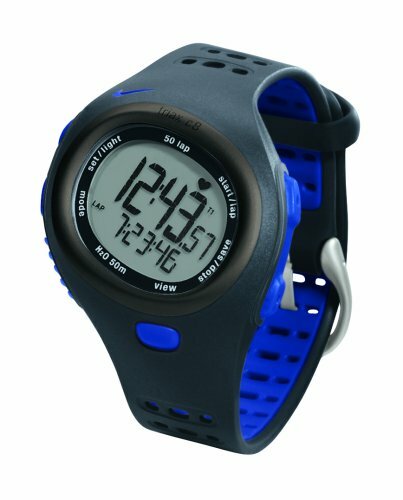 A runners chronograph (stopwatch). Shows lap and split (total) time. Introducing the Benson button. While running, you can stay in RUN mode, and press this button to see other views. Lap and split times, or heart rate. One heart rate zone. You select a high and a low heart rate. The watch beeps outside the zone, and at the end of a run, tells you how long you were able to stay in the zone. After a workout, you can review your lap times for up to 50 laps, average heart rate, and see how long you spent in your heart rate zone. Features a 2 segment interval timer. Great for a walk/run marathon, or for doing speed work with recovery sessions. Tells the time, date, and has one alarm. Safe in a swimming pool. The watch and the chest strap both have a battery hatch, so you can change the battery yourself. Watch and monitor work well. I didn't receive the product. I reached the supplier who showed all her understastanding and promised to cooperate once the C8 Nike watch returns to her. However neither the heart rate monitor nor the money are back with me. Please DO something ! I have already placed my comments regarding this situation but no one took action on my behalf.